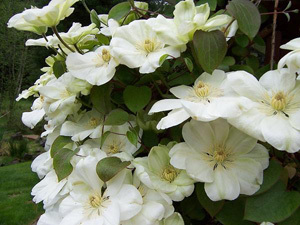 This is a very dear clematis to me. 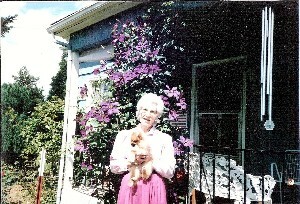 Gipsy Queen-a gift from my dear mother that inspired my nursery. 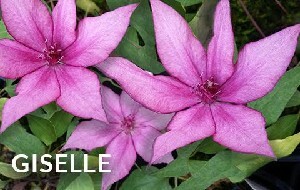 GISELLE is a beauty that is easy to grow and flowers well. Large pointy Pink flowers edged and veined in deep maroon. It would be a great choice for a container or at the base of a rose. Small to medium long bell shaped deep Red flowers fading to a dusty reddish pink. Free flowering and easy to grow. The color is deep than shown in the picture. Blooms: July, Aug, Sept, Oct. 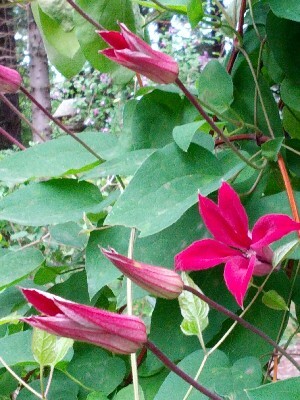 Here is another clematis that I am impressed with it's growth and vigor. Nice deep green foliage with stark white flowers.It blooms doubles, semi-doubles and singles off layered stems. It holds up well in full sun but really looks like in a semi-shady spot where it seems to glow. 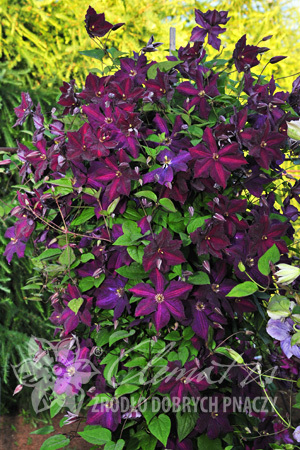 Medium to large dark velvety purple flowers with a rosy bar. Very free flowering and easy to grow. the name is in remembrance of the village in NE Poland where on July 15, 1410 where one of the largest Medieval battles took place between the Polish-Lithuanian military forces who defeated German-Prussian Teutonic Knights. 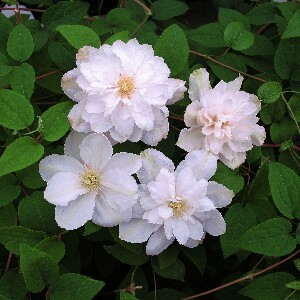 Medium to Large Creamy White flowers with a faint green stripe, yellow anthers. Very free flowering in both spring and fall if you prune semi-hard after spring flowers. Another favorite of mine and always the first to bloom.